If you are looking for a title that will scare the bejeezus out of any but the most academically minded folks, look no further than Herman Ooms' cover. Now add to that a little understood Chinese style ceremonial garment which spans a hardback cover including over 353 pages (87 of which make up the notes, bibliography, and indices), and you have little fear of the novice historian sullying your hallowed tome with his ungrateful lack of comprehension. Those willing to brave such daunting warning signs of academic minutiae, however, will find themselves in a quite interesting and engaging discussion of the turbulent Asuka and Nara periods, when much of the groundwork for later Japanese society was laid down. Don't get me wrong, this is not a book for one who balks at technical language. Ooms's use of such terms as "autochthons" and "allochthons" to describe "native" and "foreign" Japanese may strike some as unnecessarily cumbersome, but Ooms makes a case for the use of more technically precise and neutral terms to describe a history that is already overlaid with so much political bias. He breaks up an otherwise monotonous technical discussion with a subdued humor that keeps you consistently interested. Herman Ooms begins with a description of what he terms the Temmu dynasty--the lineage of rulers starting with Temmu, who came to power in a bloody coup and civil war, and ending with Kōnin and Kammu, the lineal descendants of Temmu's brother and predecessor, Tenji. He goes on to show how Temmu--the first ruler of Japan to use the term "Tennō"--combined traditional and foreign religio-political symbolism to legitimize his reign and that of his successors. He emphasizes the role of the Nihon Shoki and the Kojiki as further legitimizing documents; the compilation of the former overseen by Temmu's own son, Prince Toneri. In explaining the complex inter-familial ties and squabbles that mark the Asuka and Nara periods, Ooms provides a helpful chart on cardboard in the back of the book, perforated to allow you to remove it and use it as a guide as you read. This proves an invaluable asset as you read through the convoluted history of royal scheming and succession. 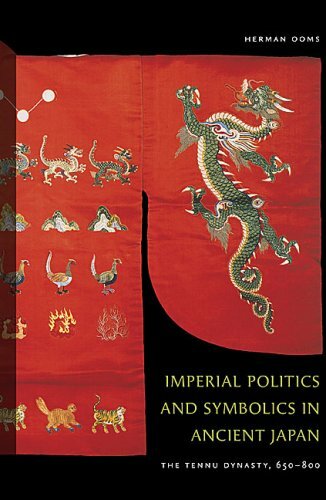 Inextricably intertwined with the origins of the symbols of imperial power were the political struggles of the royal and noble families. Over a span of only a century, we see a total of ten official rulers--one of them ruling twice--with the last being only two generations removed from the first. On the back of the handy genealogical chart is a second diagram, this one an attempt to untangle the complex political plots that crisscross the period. An example of the religio-political maneuverings that Ooms covers is the strange case of Empress Kōken/Shōtoku and her Buddhist concomitant consort, Dōkyō. Not only is Kōken the first recorded woman to be appointed crown prince, but she also takes the throne later as Empress Shōtoku without renouncing the Buddhist vows she had earlier taken. In addition, she appoints the priest Dōkyō, her consort in all but name, as Dajō-Daijin who, in turn, saturates the government with his Buddhist cohorts. Things are looking up for Dōkyō, who is poised to become the next heir-apparent, despite his lack of a royal pedigree. The climax of his explosive rise to power comes in a message from the god of the syncretic and opportunistic Usa Hachiman shrine, who appears to endorse the Buddhist clergyman as the future ruler of Yamato. After an uproar from the nobility, however, it is quickly found that the deity was misinterpreted and Dōkyō was not in fact the kami-approved future sovereign. This is only one instance of the complex interplay of politics and religion in this dynamic period. This book is a must-read for those interested in this exciting and tumultuous, if brief, period. Ooms explores the foundations of the Japanese state and the interplay between politics and religion. It is a deep and weighty subject, made digestible through gentle sips of a dry and erudite wit. For more information, see the review posted in the S-A Bookstore, hosted by Amazon.